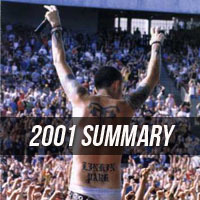 2001 was a hectic year for Linkin Park, with the band playing more shows that year than any other year in their touring history. Since Hybrid Theory kept selling more copies each and every day, 2001 took Linkin Park from opening spots on club tours to headlining venues across the world. The year began with LP visiting Europe for the first time, a continent that would feature them four separate times throughout the year. "One Step Closer" was performed on NPA in Paris and the band stopped by BBC Radio 1 to record a few tracks for their single releases later in the year. Three headlining shows accompanied these performances in Paris, Hamburg, and London. The London show at Tutu's @ King's College has a great full-on proshot video that is available for fans that showcases their first show ever in the UK. Upon their return to the United States, Linkin Park played "One Step Closer" on Conan O'Brien in New York City before heading back west to kick off their first-ever headlining tour across the country. In Seattle, the band debuted "Crawling", "Pushing Me Away" and the "High Voltage" (Reprise Version), three songs that were not performed in 2000 as far as we know. This headlining setlist included every song on Hybrid Theory except "Cure For The Itch" as well as "High Voltage' and "And One". At the time, the band said these were some of the hardest, most exhausting shows they have ever played due to their set length almost doubling from the year prior. A few shows at the end of the tour were moved to larger venues (Pittsburgh and New York City) after the band sold out the original venues quickly. The New York City show on this tour is where the only known video of Mike jumping into the crowd from the stage (on "And One") came from. A week after the successful Street Soldiers Tour, Linkin Park headed to Europe to open for the Deftones' 'Back to School' Tour. Along with two shows in Manchester and a packed London arena show, LP performed at Top of the Pops in the UK as well as playing in many new countries for the first time ever. Following this tour, the US-to-Europe Tour took LP around the globe in about two months to perform wherever they could, including trips to New Zealand, Australia and Japan. Their inaugural performances at Rock am Ring and Rock im Park came in early June, with Rock im Park getting two shows as Linkin Park filled in for Slipknot later in the evening. At these two festivals, Linkin Park played a short piece that fans have called "Be Yourself"; quoting LPLive member Astat, "This little interlude is one of the most mysterious things in Linkin Park's live concert folklore. It was randomly played by Brad, Rob, and Phoenix at the June 2nd, 2001 Rock Im Park show in Germany, in what sounded sort of like an improv jam, but it also seemed like the three of them knew their parts a little TOO well, so it's long been suspected that this is part of an unreleased early Linkin Park demo, possibly the long-fabled "Pictureboard" track. The title "Be Yourself" was given to this piece by fans, due to Chester repeatedly singing that phrase over the ending of it (it's been erroneously called "In Yourself" for years). This interlude was subsequently played again at two more shows on June 3rd and June 8th, only to disappear as suddenly as it appeared! No further information about this piece has surfaced over the years." In June, they came back to North America and played on Ozzfest, which really gave the band a taste of how hard it is to win over crowds. Their first-ever European Headlining Tour came in September, where they worked in more interludes into the set and debuted the song "Step Up" from the Hybrid Theory EP. Just before Europe, Linkin Park stopped in New York City to perform "One Step Closer" for the MTV Music Video Awards. The band came back and played on the Family Values Tour with the Stone Temple Pilots in October and November 2001, trekking across North America for 27 shows. Seemingly the only problem the band faced all year was Brad's broken foot, which perhaps influenced the Meteora demo title "Broken Foot" (found on an LP Underground release). Linkin Park closed the year off by headlining their own Countdown to Revolution Tour and by playing a few holiday radio shows, the final two being both nights at the KROQ Almost Acoustic Christmas 2001 shows. At the final show, LP played their first ever acoustic songs! "My December", "In The End", "Pushing Me Away", and "Crawling" (with Aaron Lewis) were the lucky songs to be performed acoustically in a mid-set breakdown at the last gig. Canceled shows from 2001 include two (possible, but not confirmed) February dates in Portugal, where the band perhaps couldn't secure proper travel visas, and a few shows to start the European Headlining Tour (including Hamburg, which was cancelled because of 9/11). Otherwise, the year went really well for the band and they gained thousands of fans across the globe! 2001.09.08 Camden - Reason: US Reading Festival canceled by promoters. 2001.09.09 Stockholm - Reason: Unknown. 2001.09.10 Frederiksberg - Reason: Unknown. 2001.09.11 Hamburg - Reason: September 11th attacks in USA. The Family Values Tour was rerouted twice - we have listed the cancelled/rescheduled shows on the year page.